The word Mausoleum means "House of the Dead", or so I was told when I visited the Darnley Mausoleum, in Kent's Cobham Wood, at the end of the summer. I'm writing about it now because for the weeks around Halloween I'm celebrating death with blog posts about burial sites and the way we commemorate those who have died. In 1767, the 3rd Lord Darnley left clear instructions in his will that 'a chapel or mausoleum [be built] as a family burying place... on top of a hill in in my Park at Cobham called Williams Hill.' 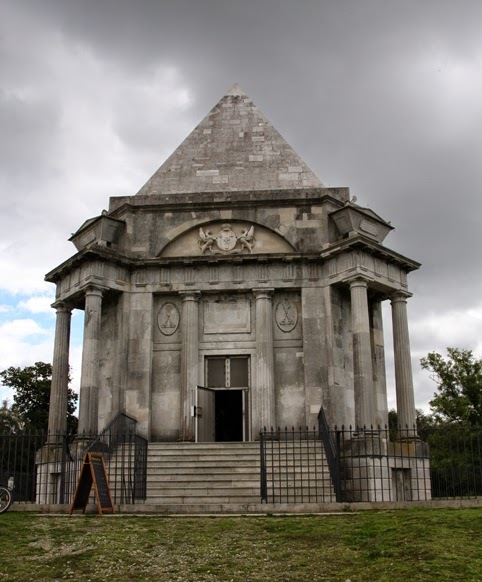 After his death, his widow asked James Wyatt, one of Britain's great architects, to design the mausoleum. 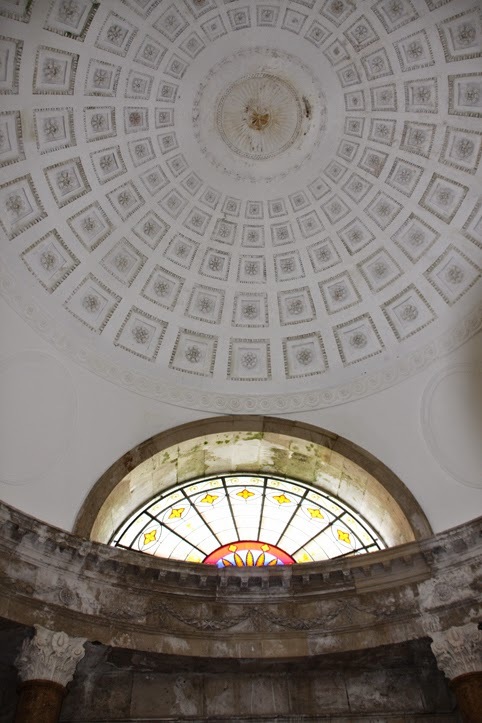 Wyatt's design was exhibited at the Royal Academy in 1783 and the mausoleum was built under the supervision of another architect, George Dance the Younger. The mausoleum fell into disrepair after the Second World War and was vandalised by arsonists on 5 November 1980. They set fire to old tyres in the centre of the crypt, causing a huge blaze that brought down the floor of the chapel above and blackened much of the interior. 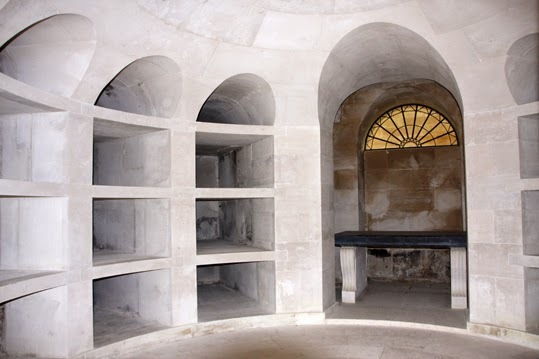 I first learnt about Darnley Mausoleum on the TV programme Restoration, in which viewers could vote for a property that they wanted to be restored. Although it failed to win the money through the programme, a partnership of local councils and organisations including the National Trust managed to raise the funds for the project. This year, 2014, is the first time it has been open to the public since then. Although the mausoleum is now closed for the winter months, it will be open again next spring. You can, of course, still visit the beautiful woodlands and see the outside of the mausoleum. The photos on this page show a little of what it looks like inside and out.